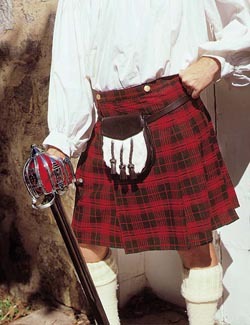 Colors and designs of the plaids used for kilts conveyed no specific meaning until the 18th Century. At one point in time the higher classes showed off their means with the number of extra colors their kilts displayed. This method of communicating the wearer's place in the social structure soon grew out of fashion and folks began wearing whatever they wanted. Kilts were originally pleated on the floor before being tied around the waist. We've made this attractive kilt easier for you to put on by sewing in the pleats. Looks great on lads and lasses. Two plaid choices available: red/green or camel/navy. Choose S(28"-30" waist), M(32"-34" waist), L(36"-39" waist) or XL(42"-44" waist). XXL (46"-48" waist) is available for $5.00 extra. Dry clean only.